Copywriter | Portfolio | Dialogues . 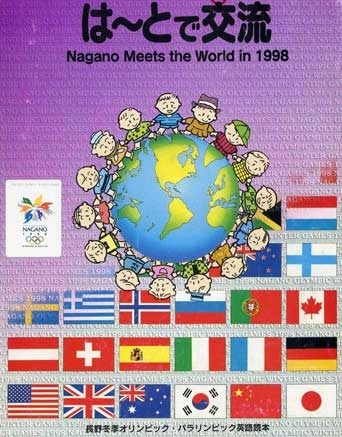 This dialogue was one of many put together as part of the English-language programme designed for volunteers at the 1998 Nagano Olympic Winter Games. Each dialogue demonstrated specific grammar and vocabulary and was an integral part of weekly language lessons. Adult, Japanese students of English with a good grounding of the nuts-and-bolts of the language, but who needed to develop the confidence to carry on real-life conversations. Shizuko: Actually, it's pronounced Ya-ma-no-uchi. Shizuko: Yes, it means "inside the mountains." Japanese names all have some sort of meaning. James: Really? Can you give me some other examples? Shizuko: Well, my last name is written with two kanji characters. The first means "small" and the second means "wood." Japanese names often refer to something in nature. How about English names? James: Well, English names usually don't have a particular meaning. But in the case of my family name - Armstrong - I guess it means one of my ancestors had very strong arms! Shizuko: I see! Well, Mr "Strong Arms," could you please help me open this jar of jam? James: I would be glad to, Ms "Small Wood!"